How About A Gluten-Free Dairy-Free Tropical Summer Dessert? Okay. I have a riddle for you. 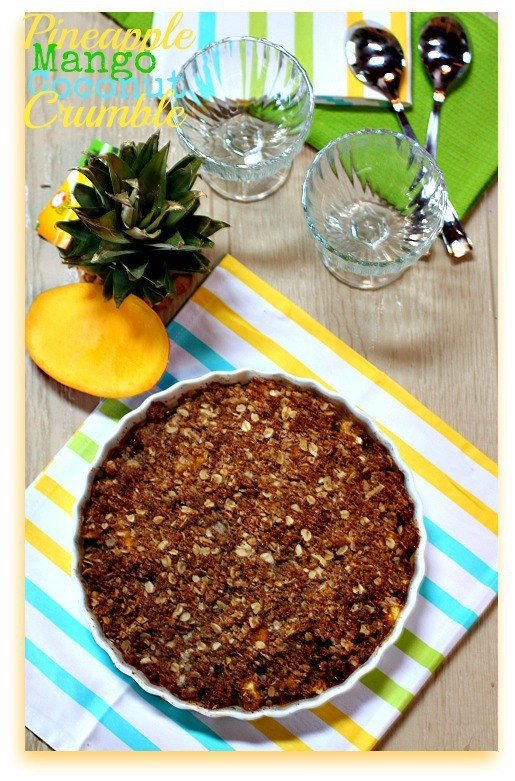 What do you get when you cross a pineapple with a mango with some shredded coconut and then top it off with a delectable coconut crumble topping? Okay. I know the title of this post kind of gives it away. I have never been very good at riddles anyway. I have never had this type of a crumble dessert before. But with pineapples piled high in the stores and ringing in super-duper cheap right now, I decided to use up the one quickly ripening on my counter and mix it with a bit of mango that was hanging around. The result? A perfect summer fiesta in your mouth! The pineapple caramelizes in this much like it does in Pineapple Upside Down Cake. And, of course, we all know that the sugary pineapple is everyone’s favorite part of that dessert. 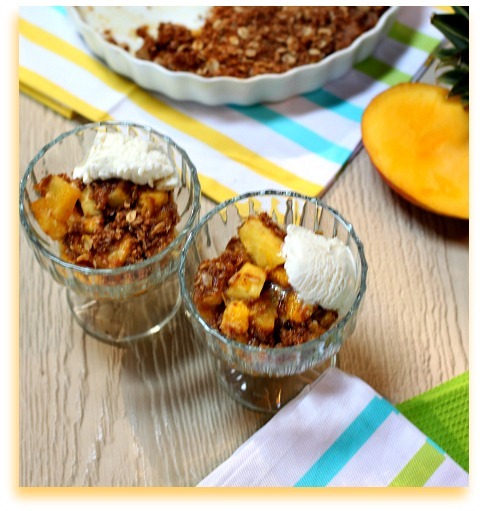 I am now officially in love with this fun new tropical gluten free dairy free summer dessert. I suppose I could list some of the reasons you should give this a try. 1. There are so many health benefits in pineapple that you can’t help but feel a little good about eating this. 2. It only takes barely 15 minutes to throw together before tossing it in the oven. 3. That this goes far far too well with some Dairy-free Coconut Ice Cream. 4. That this recipe makes far more crumble topping than you need…but no one notices…because it is a well-known secret that that IS, after all, the best part. 5. That this is Gluten-free, Dairy-free, Egg-free, Refined Sugar-free, and EASILY EASILY Nut-free. I’ll just go ahead and share the recipe now. 1. Preheat oven to 375 degrees. Lightly grease a 9 x 9 square glass baking dish or a round pie dish or cake pan. In small bowl, mix together all filling ingredients: Pineapple, Mango, Gluten Free Flour Blend, Coconut Palm Sugar, Shredded Coconut, and Vanilla. Place in prepared baking dish. 2. In another bowl add your chilled Coconut oil (or Butter or Butter Alternative), Certified Gluten Free Oats (or quinoa flakes), Almond flour (or additional all-purpose flour), Gluten Free All Purpose Flour, Shredded Coconut, Ground Chia or Flax Meal (if using), Coconut Palm Sugar, and Sea Salt. Use a pastry blender (or a fork) to crumle/cream your ingredients together until coarse meal forms. 3. Spread topping over Pineapple-Mango filling. This makes a lot of topping. Place baking dish in pre-heated oven for 35 minutes. If you like a crispy top, you can turn the broiler on for 2-3 minutes at the very end, but watch VERY carefully if you do this so it does not burn! And for a little savory treat to go along with this Summer Dessert, go check out my Gluten-free Zucchini Fritters over at The Balanced Platter today. 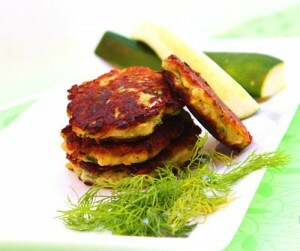 They are a perfect way to get those kiddos eating Zucchini this summer while they are in full season! Well, when you add in all the reasons to make it…how can I not! This looks like my kind of summer treat! Yum!! This sounds amazing. Where did you get the recipe? Kim! This is pure genius. I’m so impressed 🙂 My Dad, who is a pineapple lover, will love this recipe! The flavors are meant for each other. And yes, I was drooling! What a lovely tropical treat! yummo! oh my gosh that sounds so delicious! i love that combo of flavors! yum! Oh My! This recipe is like taking a vacation. Love it! That looks amazing, Kim! What a great combination of flavors. My mouth is watering. This was delicious! And we may or may not have had some for breakfast too! Thanks for the great recipe! Yay! Thanks for letting me know that you liked it, Kristy!! And, just so that you don’t feel bad, we ate it for breakfast the next day, too…and then for a little dessert after lunch! LOL 😉 So glad that you came back and gave your report! Hi Mary Ann. I actually purchase all of my ingredients as either Trader Joe’s or Whole Foods. But any items that I list in my recipes can also all be found on Amazon as well. I have also ordered them from there many times too (when I was laid up with a foot cast I could not get to the store, so Amazon was my new best friend). Hope that helps. Let me know if there is something specific that you cannot find.